BAX-LOK fitting part numbers are constructed from symbols that identify the size and the material used. Optional Feature: BAXCELL offers Tube Fittings with CASE HARDENED ferrules for which the process is outsourced from a multinational who are world leaders in providing thermal processing services having 170 locations in 27 countries worldwide employing the latest technology & with years of expertise in this field. For fittings with CASE HARDENED ferrules, please add CH after above part no. BAX-LOK tube fittings are ordered by part number as listed in this catalogue. Imperial tube and pipe thread sizes are designated by the number of sixteenths of an inch. Eg. ½" tube = 8/16=8,1/4" NPT =4/16=4. Metric tube is designated in millimeters and prefixed "M". Eg. 12mm tube = 12M. 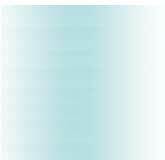 The thread size is written as a fraction Eg. ¼ NPT = ¼N. A letter or combination of letters and numbers are used to designate the type of fitting. Eg. MRT = male run tee. Please see visual index. Please mention material & grade after fitting part no. BAX-LOK tube fittings can be supplied in almost any material suitable for machining. The BAX-LOK twin ferrule fitting consists of four precision engineered parts designed to provide secure leak- proof joints capable of satisfying high pressure, vacuum and vibration applications. Fittings are supplied complete and ready for use. The front ferrule swages onto the tube as it moves down the cone of the body creating a pressure/vacuum-tight seal on both tube and body by the interface pressure and surface finish of mating components. The back ferrule then deforms inwards in the cone of the front ferrule, forming into the tube and creating a strong mechanical hold on the tube. The BAX-LOK fitting has been specifically designed for use on instrumentation, process and control systems, together with equipment employed in Chemical, Chromatography, Petroleum, Power Generation and Pulp & Paper plants. BAX-LOK tube fitting have also been used in some of the most severe and demanding applications. BAX-LOK fittings are available in 316 Stainless Steel, Brass, Steel, Aluminum, Monel, Hastelloy C, Incoloy 825, Inconnel 600 and Titanium. Straight fittings are machined from cold finished bar stock and shaped bodies are machined from close grain forgings. 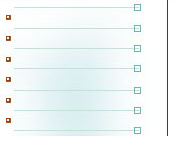 The raw materials used fully conform to the chemical requirements of one or more of the specifications listed below. BAX-LOK tube fittings do not twist the tube during installation. The BAX-LOK fitting design ensures that all make and remake loading is transmitted axially to the tube. Fitting make-up is eased due to a silver plating of the tube nut threads, which acts as an effective lubricant and prevents galling. In make-up, there is no undue force in an outward direction to distort the fitting body or ferrules to cause interference between the ferrules and the nut. This assures that the nut will back off for disassembly and permits a greater number of end remarks. Positive, reliable connections with BAX-LOK fittings have been qualified with exhaustive tests and over years of experience in the manufacture of quality tube fittings. Specific product features such as burnished cones for superior sealing and exacting manufacturing tolerances for consistent product quality, all contribute to the effective sealing of the fittings. In tests, after repeated remakes BAX-LOK fittings effected a Helium seal at over 200 bar. Vibration and impulse tests in the multi-million cycle range prove outstanding sealing capability and fatigue resistance. Metric tube fittings are identified by a stepped shoulder on both the body and the threaded end of the nut as illustrated. The BAX-LOK twin ferrule tube fitting is precision engineered to exacting standards. Careful selection of high quality tubing together with the appropriate BAX-LOK fitting will ensure the installation of safe, leak free systems. The following tables are intended as a guide to tube ordering. The tube sizes listed are regularly tested to bursting pressure in both maximum and minimum wall thickness using correctly assembled BAX-LOK tube fittings, with no sign of leakage or failure at the connections. For use with tubes of wall thickness other than those listed, recommendations regarding working pressures for BAX-LOK fittings can be obtained from our Technical Dept. Tube should be fully annealed high quality stainless steel tubing to ASTM A-269 or equivalent. The preferred hardness is Rb 80 or less, if harder tube is used Rb 90 is the maximum allowed under ASTM A-269. The working pressures in the above tables are based on actual tests on ASTM 269 tubing with a safety factor of 4:1. They apply to a metal temperature range of –20o to +100o C.
The National Pipe Taper thread has a thread angle of 60o, and is mainly used in the petrochemical and process industries. NPT – National Pipe Taper threads for connections where pressure–tight joints are made on the threads utilizing a thread sealant. 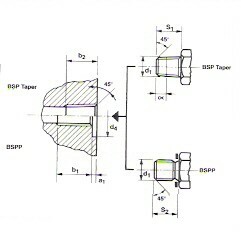 BSPP and BSP Taper threads have a thread angle of 55o. The spot face surface must be square to the pitch diameter and free from longitudinal and spiral tool marks. BSPP – British Standard Pipe Parallel threads are used in tubes and fittings where pressure-tight joints are not made on the thread, i.e. a peripheral seal is used. BSP Taper – British Standard Pipe Taper threads are used in tubes and fittings where pressure-tight joints are made on the threads. 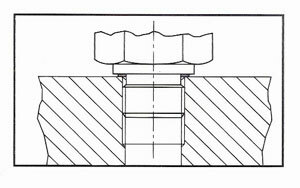 Pressure-tight joints of screwed connections with taper threads are achieved by the application of a sealant to the surface of the external male thread. A minimum of five layers of PTFE tape should be wound around the external taper thread prior to the assembly. Starting with the first thread, wrap the tape in the direction of the thread spiral. Sealing compounds and liquid sealants. Apart from polymer joint compounds and air-drying liquid sealants, the most common thread seal is an anaerobic synthetic resin, which cures in the absence of air. Following assembly and tightening, the curing process is induced by a catalytic reaction between the resin and the metal. Resins that contain PTFE ease dis-assembly. For applications in food related industries, the thread sealant must be to a specified food-grade. Connections are normally ready for operation following one hour curing time, complete curing may take up to 24 hours. 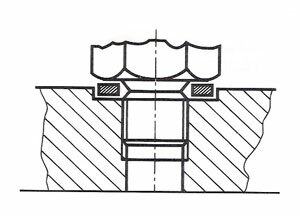 Pressure-tight joints of screwed connections with parallel threads are achieved by placing a seal between the two-machined faces. Washers and rings are manufactured in many different materials including fully annealed 316 stainless steel, copper, aluminum, fiber, and plastics. 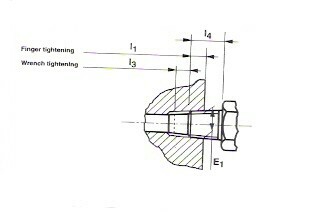 The tightening torque at assembly will vary according to the tensile strength of the fitting material, and the elasticity of the peripheral seal. 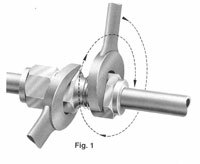 The torque should be carefully selected to avoid compressing soft seals to the point of extrusion. Elastomer sealing rings bonded into metal washers. Bonded seals are reusable, and cater for a variation in the quality of the machined surfaces. BAX-LOK tube fittings are supplied completely assembled. 1-Ensure that the end of the tube is cut square and any burrs removed without causing undue chamfering of the tube end. 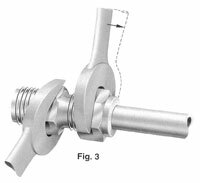 2-Insert the tube into the BAX –LOK fitting ensuring that the tube is firmly butted home into the body of the fitting and the nut is finger tight. 3-With the body firmly held, mark the nut in the finger tightened position, and rotate the nut one and a quarter turns from the marked position (fig.1). The correctly made connection is then completed. 4-For sizes up to 3/16” tube fittings, only three quarters of a turn from finger tight is necessary. To allow for possible tolerance variations in tube diameters when the application demands the maximum pressure sealing capabilities of the fitting, it is recommended that the nut is tightened until the tube cannot be rotated by hand. From this point the nut should be tightened one and a quarter turns. With BAX -LOK tube fittings the connection can be disconnected and retightened many times and the same reliable, safe, leak proof connection obtained. For applications where lack of space precludes normal assembly a set of hardened pre-assembly tools is available to enable the nut and ferrules to be pre-assembled onto the tube. 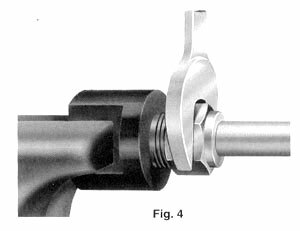 With the assembly tool secured in a vice, insert the tube and assemble (fig. 4) as per installation instructions.